Kalamazoo, MI: On February 17th 2017, Officers from the Community Policing Unit and Kalamazoo Valley Enforcement Team executed a search warrant in the 4100 block of Hawthorne Ridge in the City of Kalamazoo. This warrant stemmed from an on-going investigation in the distribution of illegal narcotics from several suspects living in the area. 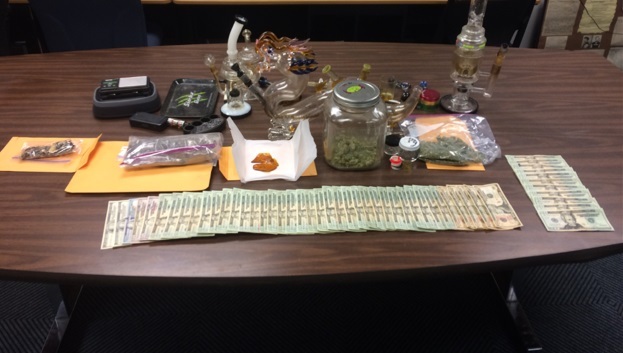 Upon searching the residence, Officers located marijuana, marijuana wax, Psilocybin mushrooms, suspected LSD, and several other items used in the production and distribution of illegal narcotics. Also taken as evidence was over $1200.00 in US currency believed to be the proceeds of drug trafficking. This case will be forwarded to the Kalamazoo County Prosecutor’s Office for review. Officers from the Community Policing Unit would like to thank the citizens of Kalamazoo for their multiple tips regarding this incident. Investigations like this result in a better quality of life for citizens that live in this area.